AvL’s 60cm Manual Backpack FlyAway Antenna System is ultra lightweight – weighing less than 35 lbs packed – and compact enough to fit into an airline carry-on-sized backpack, but the robust carbon fiber reflector is rugged enough for operations in harsh conditions. The antenna assembles in 5 minutes. AvL’s Manual FlyAway Antennas are lightweight, compact, portable, and robust with carbon fiber reflectors and easy-to-assemble tripods. AvL’s Az/El positioners feature easy pointing as well as fine-tuning, and are easy and quick to assemble. 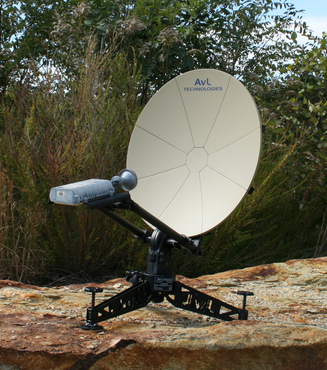 As with all AvL antenna systems, the Manual FlyAway Antennas interface with any modem, RF electronics, or satellite service, and achieve pointing accuracy and pointing stability even in the most extreme conditions.